With the recent release of the TLW® check valve for the chemical and refining industry, DFT Inc. is excited to be exhibiting at Kingsport, TN for eChemExpo 2018 at booth #1011 on April 5, 2018. Visit DFT at Booth #1011The conference will be held April 5, 2018, and will include a keynote, five feature panels and 55 seminars in SIX concurrent tracks. Skip the lines, and register online! Stop by booth #1011 to learn about our featured product, TLW® a Tapped Lug Wafer Check Valve. It is designed for the chemical and refining industries for safety, by preventing leak paths and has the added feature of no exposed studs in the clamping area, which could impact the integrity of the valve in the event of a fire or corrosive environment. Stop by and see how this feature helps reduce leak paths and hydraulic shock. 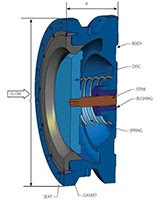 If you have additional questions, please feel free to reach out to DFT and our valve experts to further assist you. Next articleNeed a Pressure Seal Quickly During Outage Season?